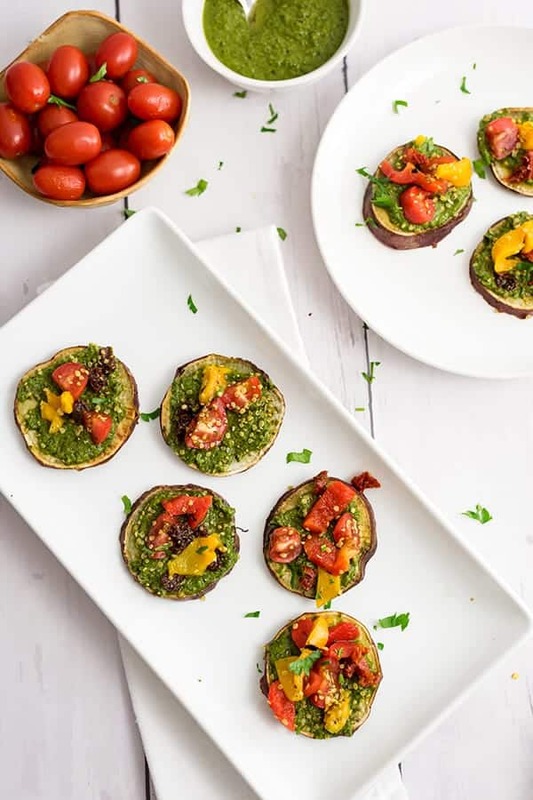 I wanted to quickly share with you guys my recent eats – which include some awesome sweet potato pizza bites that would be the perfect addition to any party spread. These are great because you can either assemble these yourself or lay out the ingredients for guests and let them go to town! 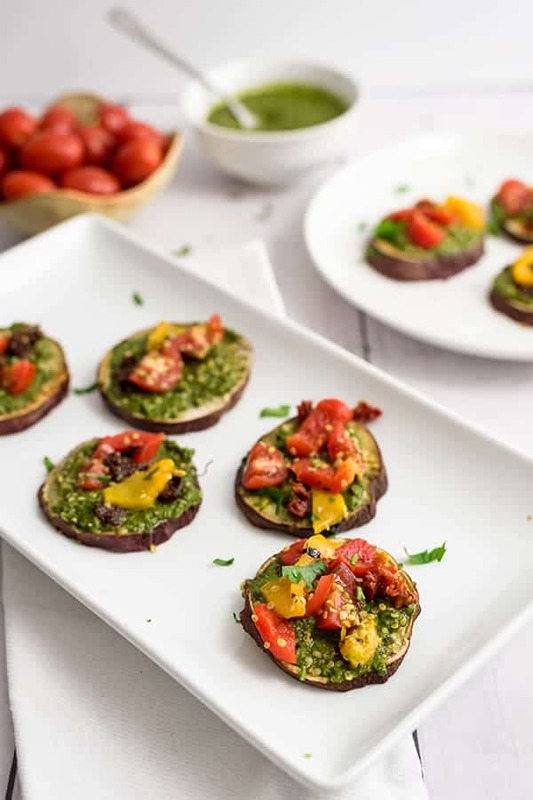 I love these little pizza bites because they are awesome at room temperature and therefore awesome for guests, especially once a little champagne starts flowing! Another great party snack I can’t seem to stop snacking on is protein puppy chow. It’s addicting, pretty healthy, and vegan, so I’m not going to complain! It would also be a quick and easy addition to your party line up, especially around the holidays! These sweet potato pizza bites deserve some serious attention. If you follow me on instagram (@bites_of_wellness) these guys made their debut last week and I’ve made them twice now. 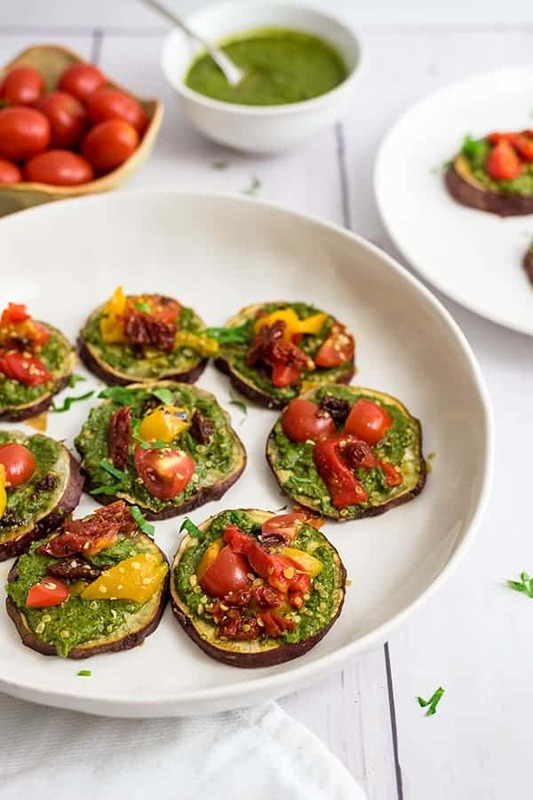 I had so much kale pesto, I just had to make these little bites. I took them to work for lunch, had them for dinner, and shared quite a few with my sister after she came home from a late night at work. I love them every time and I hope you do as well! If you love pizza, make sure you check out this zucchini crust pizza. The easiest way to make the sweet potato base is to use a sharp knife and cut 1/8 inch rounds. Go slowly to keep uniform thickness! Make sure that you take the sweet potatoes out of the oven after 15 minutes and flip them over so they get a good crust on both sides. You can use orange, purple or white sweet potatoes (Japanese are my favorite) or even regular potatoes to make this recipe! You can make the sweet potato rounds up to 3 days in advance. Just store them in a covered container in the refrigerator. These can be served hot, at room temperature or even cold! So make extra, they are always great for meal prep or for hungry kiddos after school snacks! Use whatever pizza toppings you love! Artichokes, peppers, onions, olives, pepperoni, sausage, sundried tomato, or cheese! 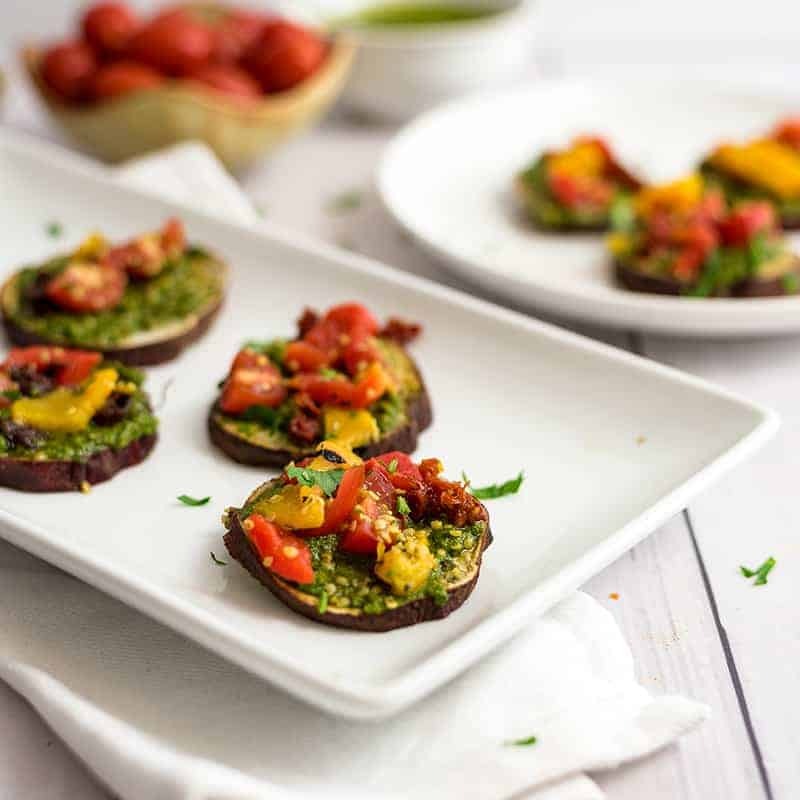 These sweet potato pizza bites are a vegan, gluten free way to enjoy one of my favorite foods - PIZZA! 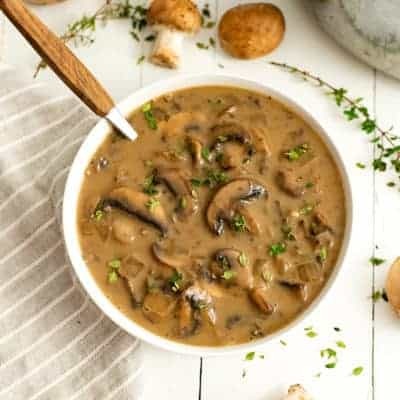 They are versatile enough you can add whatever ingredients you love but this base recipe is a home run everytime! Once oven is preheated, place sweet potatoes in the oven for 15 minutes. Take out and flip, cook an additional 7-10 minutes.. While sweet potatoes are cooking, turn a large skillet on over medium high heat. Spray with non-stick spray and add frozen artichokes, allow to cook 5 minutes. Lower heat to medium and add 1/4 tsp. salt, few cracks of black pepper and the juice of one lemon. Allow to cook an additional 5-10 minutes until reach desired level of browning. Take off heat and cut artichokes down to smaller more bite size pieces. Thinly slice roasted red pepper from jar. Place to the side. Top sweet potatoes with teaspoon or two of kale pesto, a piece of artichoke, a few sun dried tomatoes, and a few roasted red pepper slices on the sweet potato pizza. You can easily make this an assembly line for friends to make their own! Do you have a favorite party snack? Do you sometimes accidentally cook a certain way? Have you ever been accidentally vegan or vegetarian? 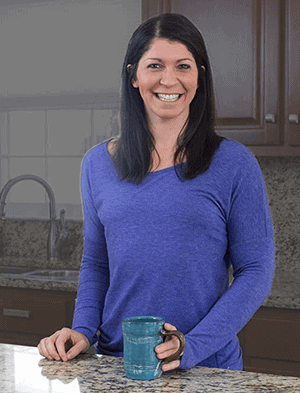 Thanks for bringing this collection of creative recipes to the #HomeMattersParty . I love your sweet potato pizza that looks quite a quick treat to make. These look and sound delicious and healthy! I love sweet potatoes. Thank you so much for linking up to Small Victories Sunday Linkup! 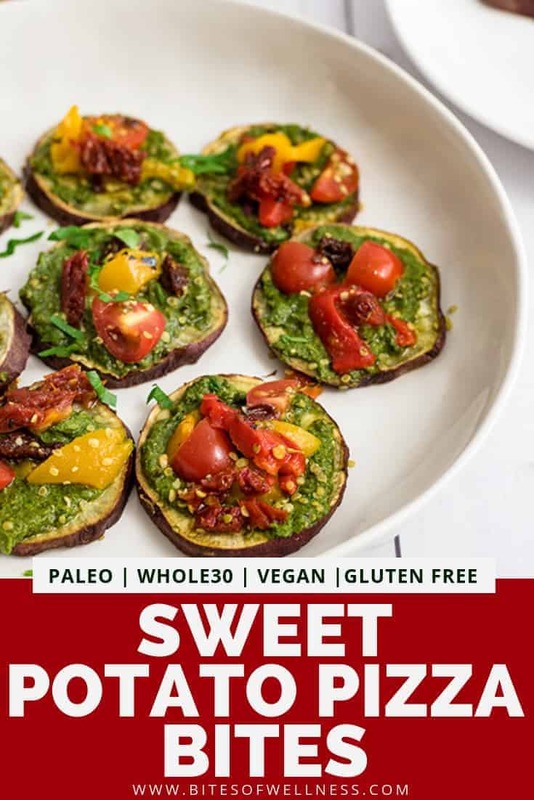 Omg I am definitely making those sweet potato pizza bites- they look absolutely fantastic! Especially that big spread of pesto!! Your polenta dinner topped with ALL the veggies looks absolutely mouth watering too! Steph, they are so fun and easy! Enjoy them, I’m sure you will come up with some great combinations of flavors and toppings too! I’m glad someone else appreciates all the veggies as well 🙂 Thanks for stopping by!! That pizza looks sooo good, and the sweet potato bites look even better! I recently had a portobello burger slider with sweet potato rounds as the “buns”.. such a good idea – I need to break out of my sweet potato comfort zone! 🙂 Happy New Year, Sam! Yum sweet potato buns sound pretty fantastic! I’m really starting to play with my food this year 🙂 LoL I just made sweet potato rounds as buns for little slider lentil burgers and they were delish 🙂 Happy New Year to you as well my dear! I would happily eat a whole batch of these sweet potato pizza bites for dinner! So fun. Joanne, you and me both 🙂 These little guys are so yummy! Enjoy and thanks for stopping by! These look amazing and perfect for when I need a pizza fix! Renee, I crave pizza daily so I had to get creative – these certainly hit the spot 🙂 Enjoy! These look super tasty! 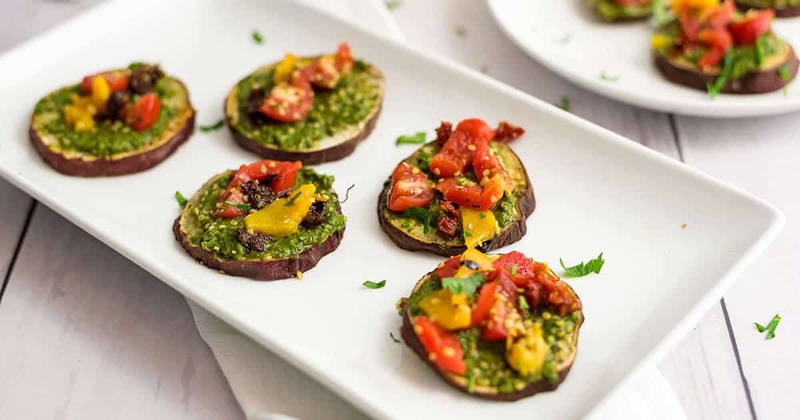 Love that you added pesto on them! 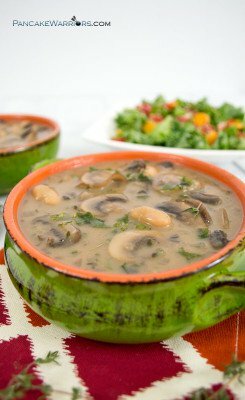 great healthy recipe! Thanks Rachel! Yeah the pesto really helps bring out the pizza flavor and balances out the sweetness of the sweet potato 🙂 Thanks for stopping by Happy New Year!! Thanks Lauren!! I can’t wait to see what you enjoyed for WIAW!! Happy New Year! Want. All. In my mouth. NOW. Happy New Year! Now get in the kitchen and make me all of these things! Yes ma’am!! No problem – I love cooking this stuff 🙂 Hope you are enjoying your day Susie!! Happy New Year!